BOOM! Studios are taking us back to the very beginning for their new Buffy the Vampire Slayer comic, re-imaging the characters and the story. Everybody has heard of Buffy the Vampire Slayer, and most of the people picking up BOOM! Studios new comic will have seen at least some of the original series. The TV show, which started in the late 1990’s, became a massive hit, turning its actors, such as Sarah Michele Gellar and Alison Hannigan, into stars and making its creator, Joss Whedon, into a household name. But now, in 2019, Jodie Bellaire and Dan Mora are re-inventing the Slayer and the cast of characters that surround her. The old will become new and a new generation of fans can discover the exciting adventures of Buffy and the Scooby Gang. 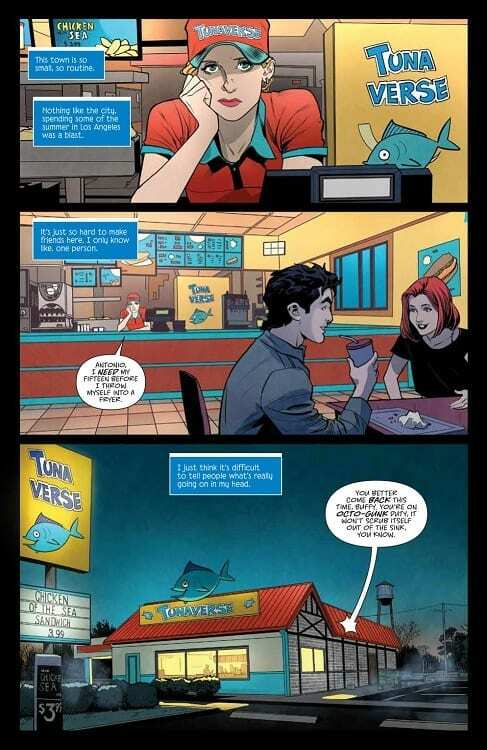 The story opens in a Tuna themed fast food restaurant where the reader is introduced to Buffy, a seemingly normal, bored teenager. She watches a couple of her peers enjoying themselves and she laments about her situation. The scene quietly moves outside and the action begins. Bellaire has decided to skip out on Buffy discovering her secret and jump to the Slayer blues that comes with hiding her secret and not being able to interact with other people her age. 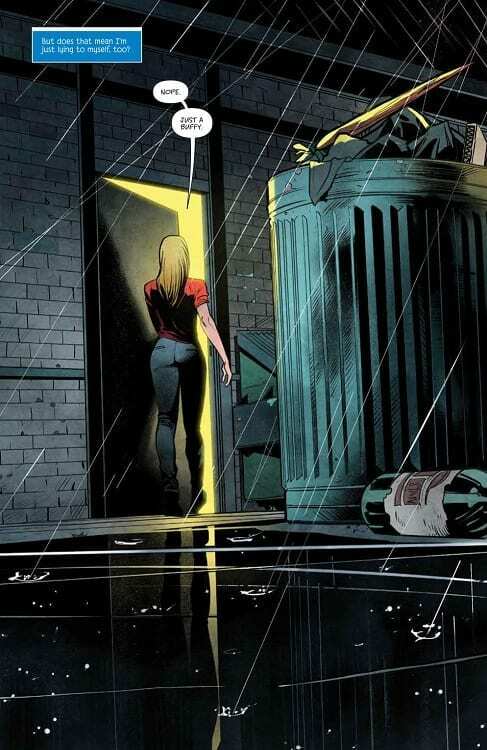 This outcast element of the character forms the backbone of this first issue and allows for the creators to explore Buffy’s new world while introducing it to the readers. One thing that becomes instantly apparent is the strength of the central character. Her presence on the page and the confidence that Bellaire injects into her dialogue makes her stand out above each of the other characters. From the very beginning it is made clear that she is something special, and not just a Slayer. This is a reflection of how important the character is to so many people, including Bellaire and Mora. You can feel the love and the respect for the Slayer’s world in this issue. Other characters are introduced, some instantly recognisable such as Giles the Watcher who is as focused on the job and as blind to Buffy’s civilian life as Anthony Head was in the 1996 original. Some of the characters aren’t as fans may remember them, but this is where this new comic series is going to be fun. Bellaire gets to play with a massive cast of characters and re-invent them to surprise the readers. This opening issue has a narrative that is spot on for a re-boot of a popular character. Buffy is exactly as you would expect her to be, reset to factory setting so to speak, and the world around her is familiar but still new. Bellaire captures the ‘snark’ that made the original series so popular without it being out dated or cheesy. 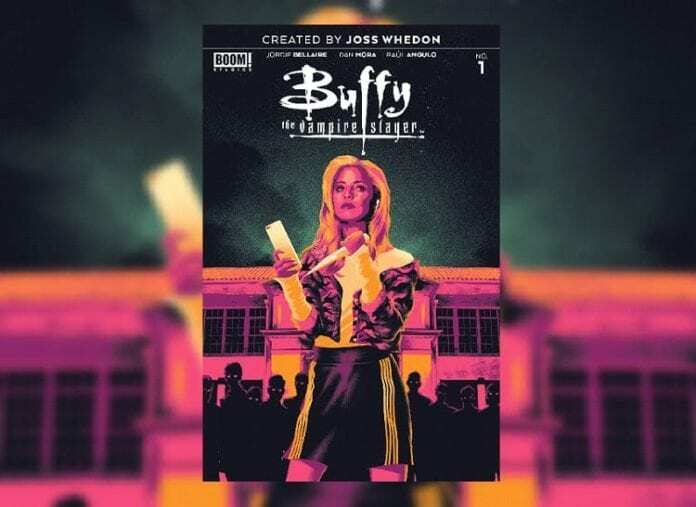 The Buffy-speak that became synonymous with Joss Whedon’s early career is alive and well and serving this comic beautifully. The best part of the Buffy world that has survived is the empowerment of the central character. Buffy is a hero. Troubled and reluctant, sure, but she still does what has to be done to save the lives of the people around her. She was a character that people could admire and look up to and this aspect is present in this new take on the character. There are several panels where, as readers, we are forced to literally look up to Buffy as she towers above us like a superhero. You can change a lot about a character but this is something that is intrinsic to Buffy and Bellaire gets this part of the character spot on. Mora has a fine line which allows for some excellent figure work. His characters are wonderfully rendered and their resemblance to the actors in the T.V. show is amazing. So much so that on the opening page you know exactly who Buffy is watching despite the fact that they haven’t been introduced by name. There is so much detail in each panel. The energy of the character’s bursts from the page making them stand out however, the backgrounds complete the pictures and create a perfect setting. Raul Angulo’s colors create mood from one scene to the next and there is a definite tonal shift from the day scenes to the night scenes. Angulo has a good grasp on light sources and uses this to the advantage of the narrative highlighting aspects of the panels with subtle shadows or glaring spotlights. Ed Dukeshire has perfect placement for the speech balloons keeping them out of the action. The contrast in balloon designs helps the reading experience. This is most notable between the human and vampire speech. The human balloons are smooth ellipses whereas the vampires have an uneven, wavy edged balloon with crooked tales. This means that, even before you have read any of the dialogue or seen the images, there is something different between the two species. On a very simple level the clean, ordered balloons represent ‘the good’ while the uneven balloons represent ‘the evil’. This is such a simple signifier that the reader accepts it subconsciously and processes the information instantly so that it doesn’t interrupt the pacing of the confrontations. Nostalgia is a powerful thing. It has inspired a great number of people to work on projects that reboot and re-image T.V. shows, movies and characters from all of pop culture. It’s especially prevalent in comic books with DC and Marvel making a game of reintroducing characters back to the same reader’s year after year. But to tackle something like Buffy The Vampire Slayer is a brave and difficult decision. There are legions of fans all who love the Buffy-verse with varying levels of intensity. A reboot of this kind is going to be laid under a microscope and systematically dissected. Luckily for BOOM! Studios, Bellaire and Mora have produced an excellent comic worthy of the Buffy legacy. The love for the series is evident on every page and the influence of the show is there in the dialogue, the action, and even the nuanced storytelling elements. ‘Welcome Back to the Hellmouth’ is an apt name for the story because this comic manages to be a reboot without it feeling like a reboot. The readers will instantly feel at home with the characters and will unconsciously be drawn back into Sunnydale and all the delights it has to offer. Where the story goes from here? Who knows but it promises to be as wild a ride as the original series was way back in 1995.
Who loves the Buffy-verse? What characters are you hoping will reappear in this retelling of the famous story? Share with us in the comments below.